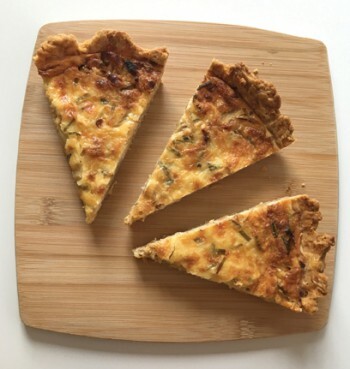 Keen baker Jen Morris, of Rowney Green, creates a vegetable quiche that’s bound to be a hit with the whole clan. My family represents a motley crew of dietary requirements: vegetarians, pescatarians, lactose-intolerant, gluten-intolerant, shellfish allergens . . . the list goes on. Oh, and my Dad, who eats anything. So, when we get together at Easter, it will be a buffet that solves my catering conundrum and this quiche is enjoyed by (almost) everyone. You can double the recipe if you have a large clan; just bake it lower and slower. 1) Thinly slice the onions and fry them over a low heat, in the oil and butter, for 20 mins until they are soft. 2) Pre-heat your oven to 200 C / 180 C fan / Gas 6. 3) Line a flan tin with the pastry, then cover with baking parchment and baking beans (or dried pulses) and “bake blind” for 12 mins. 4) Meanwhile, stir the sugar into the onions and raise the temperature of the flame to moderate, while they caramelise and turn light brown. Remove from the heat to cool slightly. 5) After the 12 mins baking time, remove the baking beans and parchment from the flan case, then bake the case for a further 5 mins. 6) Whisk together the eggs, cream, cheese, seasoning and chives. 7) Remove the case from the oven and turn down to 190 C / 170 C fan / Gas 5. Put the onions in the pastry case and pour in the egg mixture. 8) Bake for 30-35 mins until set. Remove from the oven and leave to cool for 15 mins, before serving.